Amy at Park City Girl is hosting a Bloggers’ Quilt Festival again. Thank you, Amy, for organizing this tour. This time I want to show you the quilt that bought me a ticket to Houston in 2000. I had just finished my Kameleon Quilt number 1, and my head was spinning with all the possible variations I could do with this concept when a Norwegian magazine announced a pillow contest. The first prize would be a 10 day journey to the US, – first to Houston Quilt festival and then on to Bird-in-Hand in the middle of Amish country in Pennsylvania. 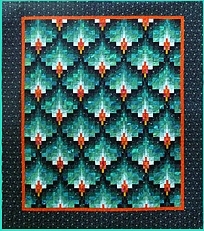 I entered the quilt below, which actually won the first prize. My husband was lucky to buy himself a ticket in the same group, so we could go together. It was a great experience. If you have problems running the video, there are photos of the different views on my website. A pattern for the wall hanging is also available. Every autumn when there is talk of Houston, I think back on the wonderful trip we had 9 years ago. Please go over to Park City Girl to see a list of all the other participants. Oh wow! Yes I think I have seen your quilt before, this concept is so fun! I was lucky enough to go to Houston last year (from Australia) and right now with all the Houston talk I definitely want to be back there! You won an amazing prize! Congratulations. Hello, my fellow Norwegian quilter! What a fantastic idea, your pillow is truly a piece of art and a worthy contest winner! Oh my goodness! This is spectacular! That is a lovely quilt!!! How wonderful to get a ticket to Houston! And I enjoyed watching the video. Thank you for sharing! Wow! What an amazing quilt! spectacular! 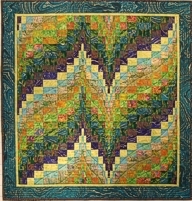 that is such an inventive quilt and so beautifully executed! I really really like your pillow. What a unique pillow and how exciting to win the contest and get to go to Houston. My son and his family live there so every year we alwasy plan one of our trips to visit them while the show is on. Unfortunately this year we couldn’t do it. That is absolutely ingenious, and gorgeous! So inspirational! Just amazing! I’ve never seen anything like it. One of these years when I get really proficient I’m going to try out one of your designs. Fabulous. mind boggling. I can barely get the pieces together and stitch in the ditch or a meander done. I am impressed. Wow! What a fantastic design for a quilt wall hanging. Three-in-one! Brilliant – my favorite was the second one in. Cheers! I rembember seeing this quilt a while ago. It is amazing. I went to the Houston show 2 years ago, and it was quite an awe-inspiring experience. Wow!!! That’s amazing. I’ve never seen that before. I LOVE it!!! Thanks for sharing. great great work and detail! I’d give you first too if I had a blue ribbon! The video is great – have never seen anything like this before – really fascinating. Reminds me of the kaleidoscopes we used to play with – ever changing patterns and colors…so pretty. Wow, amazing. I would love to make one of these quilts! That is an incredible design! Wow! I love everything about it! Oh my that is so neat! I’ve never seen one of these kinds before! WOW! What a great prize! Lovely quilt. Congratulations! Beautiful. Very interesting design. I truly love what you have created. 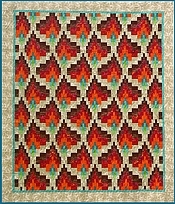 Great design, colors, fabrics, quilting. What an amazing quilt! Loved the video presentation. Great design and great fabric choices. Very clever and fascinating idea! Thanks for sharing. What a clever idea. Well done on the prize too. Great quilt and a wonderfully ingenious concept! Love it! Thanks for the video! The Kameleon quilt is absolutely stunning! Congratulations!!! Such a beautiful and unique design. Thanks for sharing. I have to agree…..WOW!!! I love it! I can imagine doing one that reflects the changing seasons of one flower. That is so great. I have never gone to Houston so I have never seen this before!! What an incredibly clever idea!!!! I’ve not seen anything like this, and I am always on the lookout for unique ways to use fabric. I will be back to visit your blog often! That is an amazing concept and you definetly had to win something with it. Thanks for sharing, I´ll be back to see what else you have under your sleeve. I love surprises, your quilt is a gorgeous one! Amazing! What an incredible concept! How exciting that must have been to find out that you won and were going on such an awesome trip. Wow …. this was amazing …. and after you opened up the first flower there was another flower which I was not expecting ….. absolutely gorgeous! A M A Z I N G I N G L Y beautiful and clever. What a clever, clever quilt. Wonderful and Wow! This technique of yours is just so much fun! I check in on your blog when I want to be inspired. I’ve never seen a quilt that you can change the designs on like that! Great idea! Thanks for sharing! That is freakin’ fantastic! I am going to check out the pattern right now. This has moved to the very top of my ‘to do’ list. I have never seen anything like that before – it’s amazing! You’re very talented and can see why you won! What fun seeing the quilt opened and opened again. Such a unique idea, and congratulations on your trip to Houston! Bloggers Quilt festival er blitt veldig populær og genererer mykje trafikk. Det har vore meir enn 1500 besøkande på dette innlegget i løpet av den første veka sidan festivalen starta, og det synest eg er kjempeflott! That’s a great idea, Amazing!! Congratulations on your beautiful quilt winning; hope you’ve had a fabulous time in the USA. A wonderful idea and a well earned prize ! I want to say a huge thank you to everyone who has visited my blog and left comments. 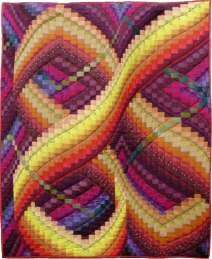 Since the Bloggers’ Quilt Festival opened a week ago, more than 1500 people have visited this post, so I am quite overwhelmed with the response. Thank you very much, all of you! den puta er bare helt fantastisk!